A capacitor is an electric component that temporarily stores an electrical charge. A "run capacitor" supports electric motors, such as in air conditioner or heat pump units, a fan motor and a compressor motor. The capacitor has two terminals. Capacitors come in a variety of sizes, depending on the capacitance (µF or MFD), such as 40 plus 5 µF, and also the voltage. A 440 volt capacitor can be used in place of a 370 volt, as it is build better, but the 370 can't be used in place of a 440 volt. It will work for a while and will fail prematurely, as exceeding the capacitor's rated voltage will cause the dielectric to break down and the capacitor to short out. Same as an electric wire- 600V rated wire is better than 300V one .The capacitance(µF or MFD) must be the same or stay within 10%+ or 5%- of its original value . Example: 50 µF cap can be substituted by 47.5 to 55 µF with the same or better voltage ratings capacitor . 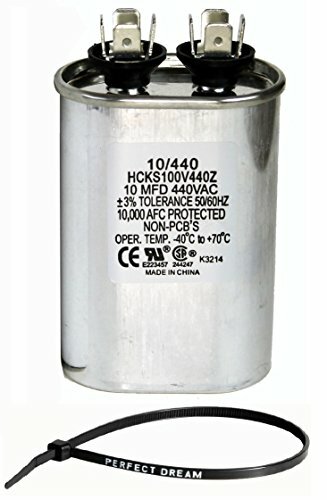 Round oval-shaped run capacitors are commonly used for air conditioning, to help in the starting of the compressor and the condenser fan motor. If you have any questions about this product by TradePro, contact us by completing and submitting the form below. If you are looking for a specif part number, please include it with your message.